Restorative Discipline is a whole-school, relational approach to building school climate and addressing student behavior that fosters belonging over exclusion, social engagement over control, and meaningful accountability over punishment. Its practices replace fear, uncertainty, and punishment as motivators with belonging, connectedness and the willingness to change because people matter to each other. Evaluations of existing programs show improved relationships on campus, increased student accountability, and dramatic reductions in disciplinary referrals and suspensions. Using the evidenced-based, Texas Model of Restorative Discipline, the Institute prepares educators to implement restorative practices through its values-based trainings, organizational consulting, and research and evaluation. The Texas Education Agency partnered with the Institute from 2015 through 2017 to train administrators and Restorative Discipline Coordinators as well throughout the state. During this partnership, IRJRD conducted Administrator Readiness and Restorative Discipline Coordinator trainings at all twenty of the Texas Regional Education Service Centers. This initiative is without precedent nationally and demonstrates the state’s evolving commitment to building healthier and humane school communities. For more information on the TEA/IRJRD state-wide, rollout project, click here. 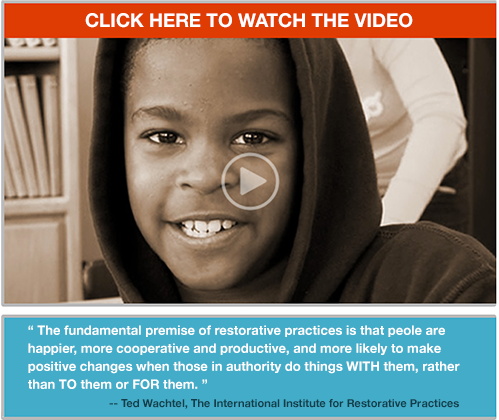 This video is used with the permission of San Francisco Unified School District Restorative Practices Program. The Institute for Restorative Justice & Restorative Dialogue can assist with coordination, training, consultation and evaluation.